In less than two decades, Gulf Coast Supply & Manufacturing, LLC, (http://www.GulfCoastSupply.com) has grown from a small family business into a major manufacturer and distributor of metal roofing. Now, with two new locations and an expanding product line, the goal is for “GCS to be a powerful leader in the metal roofing industry,” says Jonathan Sherrill, the company’s vice president. When brothers-in-law John Sherrill and Jeff Reed decided to start a business back in 1996, they had no idea it would grow into one of the largest and most-respected metal roofing manufacturer/distributors in the Southeast, but that’s exactly what Gulf Coast Supply & Manufacturing, LLC, (http://www.GulfCoastSupply.com) has become. 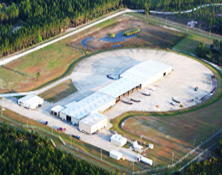 GCS Alachua – The 7,000-square-foot manufacturing facility at 14480 NW US Highway 441, Alachua, FL, 32615 – which is just off Interstate 75, less than 20 miles from the University of Florida in Gainesville – is well-suited to expedite delivery and service to Central Florida, one of the state’s key population centers. GCS Stuart – A 7,000-square-foot manufacturing facility at 8701 SW Old Kansas Ave., in Stuart, FL, 34997, in Martin County, is a perfect fit for the Treasure Coast, whose communities stretch from Hobe Sound and Jupiter in the south to Sebastian in the north and include Port St. Lucie, Fort Pierce, and Vero Beach. As with staff members at its headquarters in Horseshoe Beach, Sherrill said employees at both the new Alachua and Stuart locations are steeped in Gulf Coast Supply’s tradition of customer service and product knowledge, including its newest product – the OceanGuard Aluminum Series line of roofing. Setbacks – There is no specific setback requirement regarding distance from breaking surf or salt-water shoreline. Saltwater – It has a 25-year, anti-corrosion warranty. Coating – Kynar 500, known for its color retention, offers superior weatherability and resistance to corrosion. Yet, for all of its inherent advantages, Bowen said OceanGuard is cost-effective as well as being energy-efficient – plus the fact that “Metal has one of the highest wind ratings” is an important attribute with Hurricane Season coming in June. Additional details about OceanGuard can be found online at http://www.GulfCoastSupply.com/product-ocean-guard.html. According to Sherrill, Gulf Coast Supply has been the metal roofing manufacturer of choice for architects, contractors and homeowners throughout the Southeast. But high-quality products are only part of the GCS “Sweet 16” story. ABOUT: Gulf Coast Supply & Manufacturing, LLC, is headquartered at 4020 SW 449th Street in Horseshoe Beach, FL, 32648. For more information about the company and its products, call toll-free 1 (888) 393-0335 or visit http://www.GulfCoastSupply.com. The local number is (352) 498-0778; the fax is (352) 498-7852. Hours of operation are Monday through Friday, 8 a.m. to 5 p.m.
Gulf Coast Supply & Manufacturing, LLCHeadquarters for Gulf Coast Supply & Mfg., LLC - Horseshoe Beach, FL. Gulf Seam Panel Standing Seam Gulf Coast Supply & Manufacturing, LLC DBL-lok Mechanical Standing Seams PanelMeets “Cool Roof” requirements for Tax Credit Gulf Coast Supply & Manufacturing, LLCNew Location at 14480 NW Highway 441, Alachus FL. KYNAR 500 PVDFPVDF resin - based metal coating known for its color retention, offers superior weatherability and resistance to corrosion. 5-V RoofingThe 5-V roofing panel is one of the oldest metal roofing profiles on the market. 5-V offers the old "Traditional" look, while at the same time is commonly used to achieve that beach-side "Key West" look.